My Casio F-91W wristwatch is small and simple. It is digital, weighs little, boasts a low profile, and has every mode I need: timekeeper, stopwatch, and alarm. This model continues to earn rave reviews, despite its design remaining static for almost 25 years. This is because its battery lasts forever, it is reasonably accurate, and it’s cheap—I bought mine for $11. In eight days in the Marshall Islands, I’ve seen as many Casio wristwatches. In an entire year in the US, I’ve seen only two of this model. It’s popular—in other countries. In fact, the Casio F-91W is sometimes labeled the world’s bestselling watch. While the US may not have taken to it, this humble Japanese timepiece has maintained popularity around the world for the reasons I list above. Even Al-Qaeda likes the watch enough to favor it for use in improvised time bombs. This watch does not reflect status or wealth. It does not pair well with a Ferrari or Maserati. Its resin band is out of place next to French cuffs. What appeals so much to me, apart from its minimalism and raw practicality, is its global presence. Consumers in the United States are notorious for the volume of resources they use and for the trash they generate. Disposable coffee cups have somehow become standard. We make it okay to discard plastic forks after a single use, despite their origin as an expensive dirty black liquid extracted from thousands of feet below the ocean’s surface. Most US citizens have access to multiple sources of clean water, yet we still buy pricey and wasteful plastic bottles of the stuff. I am a part of this culture: I fill my truck’s gas tank twice a month and am currently writing this on my “old,” second laptop. Not all 7 billion of the world’s inhabitants can live like those of us in the US do. My Casio shows me this. Its global presence reminds me that I’m not the only one who purchases the products I do and that the sheer scale of people who do has a very real effect on this planet. The air pollution in China, the unstoppable arctic melting, the Great Pacific Garbage Patch —these are only tastes of a dark future we weave for ourselves. The earth is far too delicate for the handling we give it. We know this, yet we continue to over-consume, spilling waste into our air, land, and ocean. The reluctance to stop what we know is harmful is a trait we all share. In the case of resource use, this could be due to capitalistic advertising, convenience, ignorance, culture, and other factors. These influences are strong. Humans will forever be tortured by the ability to understand and predict consequences—that a pack per day of cigarettes could become lung cancer in decades or that a present purchase could mean an insufficient retirement fund in the future. The decisions we make based off of this knowledge are difficult. The nature of most animals is to shy from pain and to head toward pleasure. Humans overcome these immediate gratification impulses daily; when we run solely for exercise or when we grab carrots instead of chocolate, we are choosing logic and foresight over physical compulsions. We need to make this kind of mental decision when we consider humanity’s—and our biosphere’s—survival. We need to shift our viewpoints, adjust our paradigms, and make decisions based on logic rather than convenience. I am not criticizing specific countries, corporations, or products so much as I am a lazy and shortsighted line of thinking. We have become too comfortable with the amount of products we purchase and use. There are many ethical issues wrapped up in consumption practice, but the easiest to address just might be quantity. It is difficult to pick up a t-shirt at the store and figure out if the cotton was organically grown, if those who sewed it worked under humane conditions and for acceptable pay, etc. It is much easier to pick up a t-shirt while shopping and decide you already have more clothes than you need. I’m not asking you to stop driving or buying your favorite product. Those specific decisions are up to you. If you’re looking for a concrete way to apply these ideas, try this: for a month, buy 1/2 as many non-essentials as usual. These can be drinks, snacks, clothes, entertainment, or anything else. If you’re reading this, you probably have far more than you need. Humans can live with less possessions, but our planet cannot get by with less resources or more pollutants. Changing humanity’s habits won’t happen overnight. If we create steady trends in intentional consumption, we can slow that which has mighty momentum. When such ideas jump from mind to mind, incredible feats can be accomplished. This feat, ideally, would be the creation of a system of consumption and waste that is actually beneficial to Earth (idealistic, I know). I’m a fan of quality, reusable, long-lasting gear. (Who isn’t, really?) It typifies the idea I’m trying to convey. It is useful, ethical, and quickly grows character. Daily use has dented my Klean Kanteen water bottle and leaves presents—small blue non-toxic paint chips—on my fingers and desktop. My wallet’s leather is rubbed shiny, and it is stretched slightly where it meets the heavy duty snap button I pounded into it. And, of course, there’s my Casio F-91W, which has traveled thousands of miles with me. Barely a year old, it’s only beginning to show signs of wear: featherlight scratches on the watch crystal, a single nick both above and below the watch face, and salt crust on the stainless steel rear panel from a dive to the bottom of Majuro’s lagoon. A clear shift away from consumption needed to happen long ago. It didn’t. 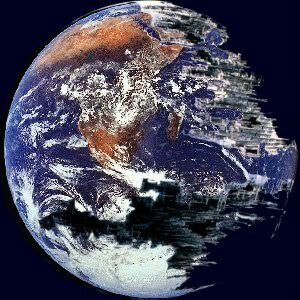 If we’re to slow our train of destruction and salvage as much of a functioning earth as possible, that shift needs to get underway. Remember that we leave to future generations not just an altered planet, but a culture of consumption as well. Buy less, buy reusable, and buy smarter. This entry was posted in Uncategorized and tagged Global Perspectives. Bookmark the permalink.